The weather can't seem to make up its mind here in SW Ohio, as we have had our first snowfall of the season as well as a late November round of severe weather including tornado warnings. With the weather swings, I was hoping something rare would show, but the birding has slowed down at my local haunts. 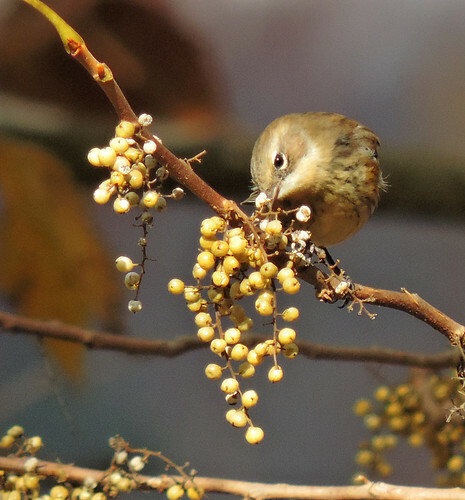 What is cool about birding is that you don't need to see rarities to have fun. I have been enjoying some of my favorite winter birds. If one comes across poison ivy berries this time of year, it is always worth waiting around a while to see what will come in to feast. 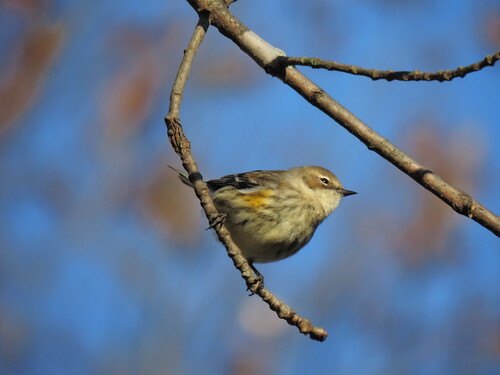 This year there seems to be a huge amount of Yellow-rumped Warblers overwintering. I have had about 30 or so in my yard for a week now. They love poison ivy! 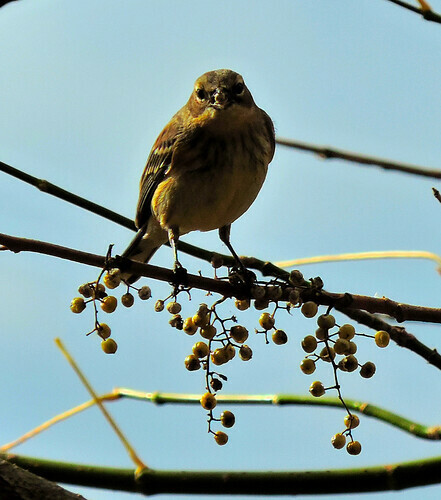 All the activity around the ivy has also drawn in other birds that were not interested in eating the ivy berries. 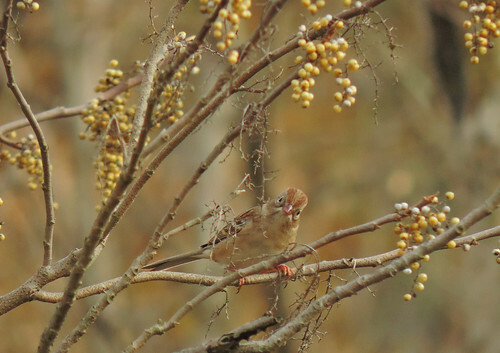 I love this Field Sparrow's look and pose. Nearby, there was a good deal of birds. 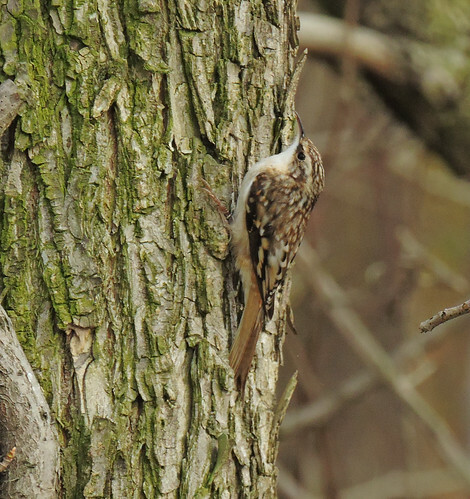 I heard a Brown Creeper and turned around to find one. I just starting pushing the shutter button, not even looking at the bird as I had lost him. I was lucky to get a good shot of one. Love this bird. Who doesn't love a creeper? 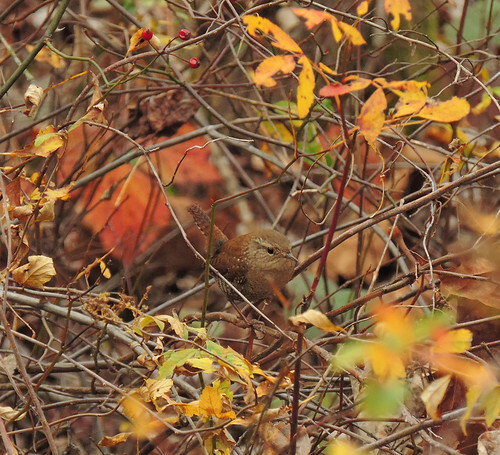 Another favorite winter bird that I got lucky to find the same day was this cute little Winter Wren. I stood still and the bird just walked through the brush not a few feet from my feet! 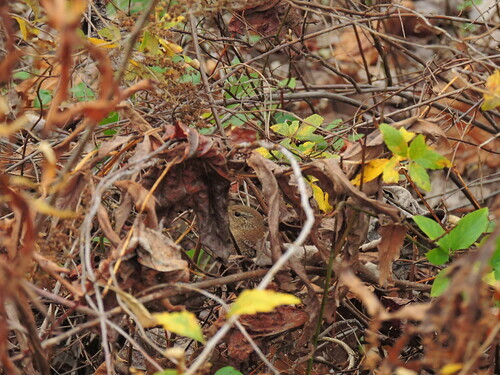 It was like it was playing hide n' seek with me. 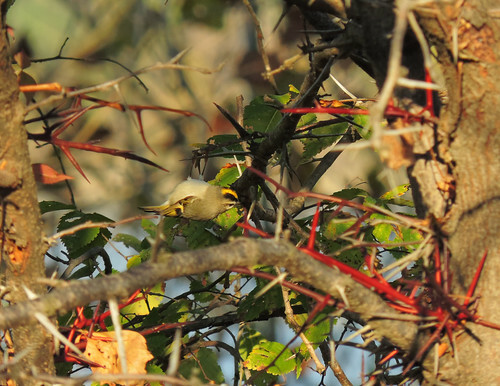 Golden-crowned Kinglets were flying around high above, they are always hard to get a good shot of. Here is one just hanging out. I like the color in this picture, I call it upside down in a sticky situation. 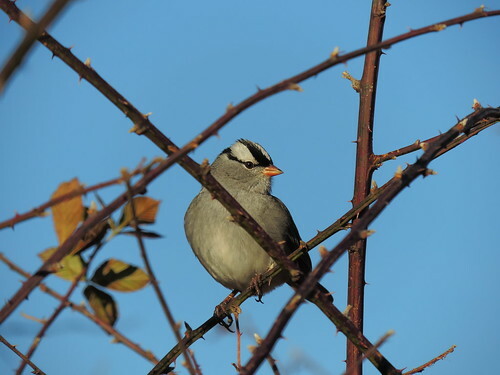 Another one of my favorite birds to run across on a cold winter day is the White-crowned Sparrow. I remember seeing this bird in my yard when I was young and wondering what it was. 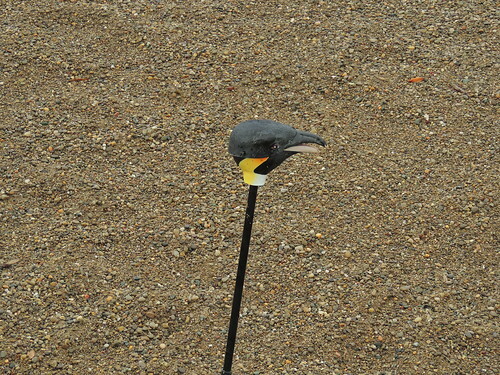 While not considered my spark bird, this bird had a lot to do with my interest in birds at a young age. Talking about color! A royal sparrow it is. Just look at that face. 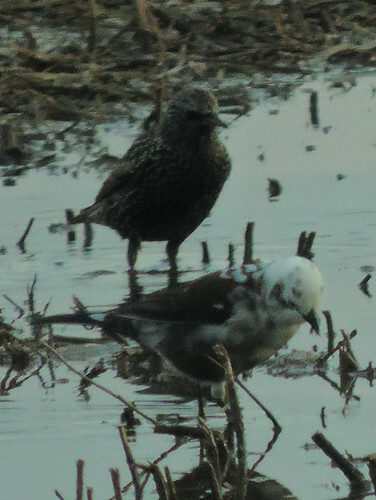 It appears that a good deal of the rarer gulls and ducks are still up north. As I write this, it is fairly mild with south winds. This weekend is supposed to harbor low temps in the teens with highs in the twenties, so maybe some will move south soon. 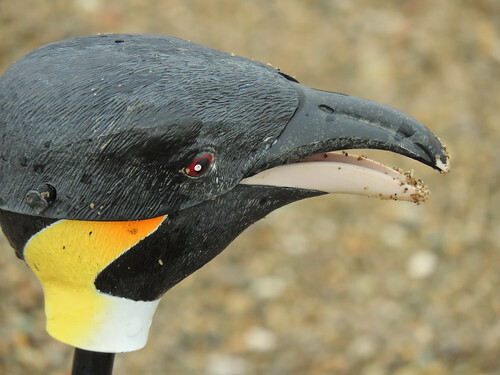 Even though it is mild I did find a penguin on the beach at East Fork. I saw this thing from afar through my binos, thought what is that? A kids toy. One never knows what you may find on the beach at East Fork. On my way back from birding East Fork the other day, I stumbled across a mixed flock of blackbirds in a wet field at the end of my road. It had a good variety of species. I was able to pick out Rusty, Red-winged, Grackle, Brown-headed Cowbird and European Starling. Then I spotted something white. 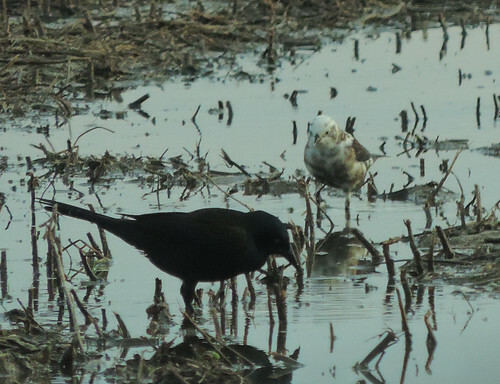 It was a leucistic blackbird. I am thinking Red-winged or cowbird. I am hoping to be able to find some winter owls this winter. I haven't seen a Saw-whet Owl outside of a banding operation in a long while. Same goes for Long-eared. I would also like to run across good views of Short-eared again. This will be a hard goal to achieve. Until I find some of the northern owls, I will enjoy the locals. 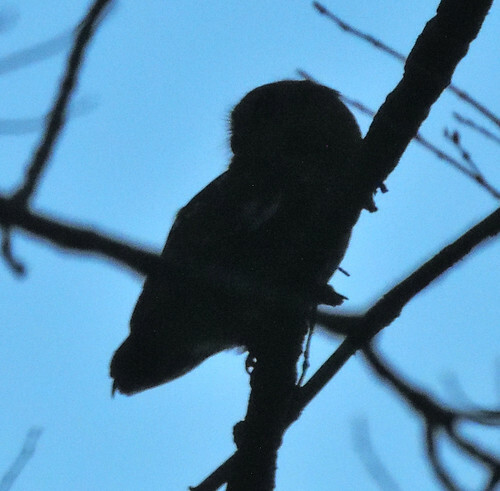 I spotted this little Eastern Screech-owl sitting in a tree as I was getting in my car at East Fork the other day. This picture was taken out the car window. If you look closely, you can see the whiskers (rictal bristles) and the cute little talons. 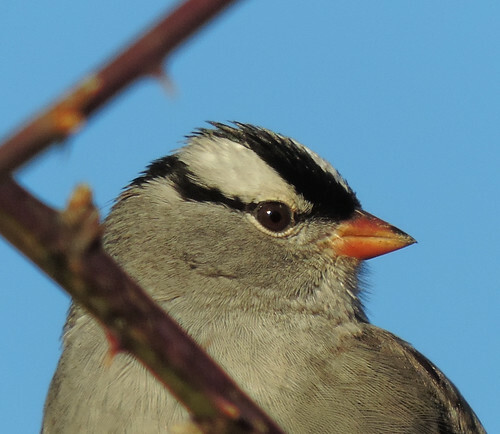 Make sure you get out and enjoy the birds that are around you and try to take someone new birding or especially a young person. Remember to always have fun! Thanks & Welcome for your comment and your next visit to my blogs. Um encanto esses pássaros que trazes! Lindos! beijos,chica e lindo fim de semana! Great variety of winter birds. Great shots! Wonderful photos Eileen! You've done a fabulous job of getting them close up.